How can i fix 23918? The title doesn't really say anything. What is the complete message? When does it happen? How do you do it? Game? OK i downloaded it what do i do now, drag the iso to it? (01-15-2017, 07:32 AM)Neui Wrote: The title doesn't really say anything. When does it happen: When I open 1 Player "Wiimfi WFC"
How do you do it: By waiting a couple of seconds after I open 1 Player "Wiimmfi WFC"
You posted there look at my reply. 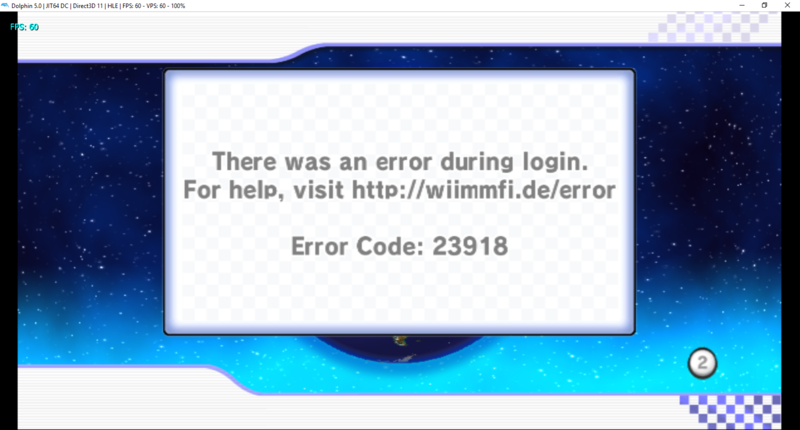 I was just confirming that wiimmfi is the error code. You need a NAND dump from a real Wii to use Wiimmfi. (01-15-2017, 10:03 AM)Kurausukun Wrote: You need a NAND dump from a real Wii to use Wiimmfi. What is a NAND dump? And I have 2 real Wiis. It means you need to wait 1 week. Try on the 22nd of January.